With our Gateway to college program holding its graduation ceremony this Monday I thought it would be worth sharing news about the recognition our partnership with the Pueblo Community College recently received. This week the Gateway to College National Network honored PCC with a 2016 Gateway Graduation Achievement Award for exceeding the national network’s graduation rate benchmark in 2014-15. The letter of recognition received by PCC’s program said that “based on a strong partnership and a shared vision with your school districts, your program is poised to build on its successes and can serve as an example for the rest of our network. You have not simply made a difference for students in Pueblo and Cañon City, Colorado; the work that your school district and college partnership has accomplished is a model for how we solve these persistent problems as a nation.” Gateway to College provides an alternative route to a high school diploma for students; they are treated like college level students and are able to earn their high school diploma while gathering a significant amount of college credit along the way. 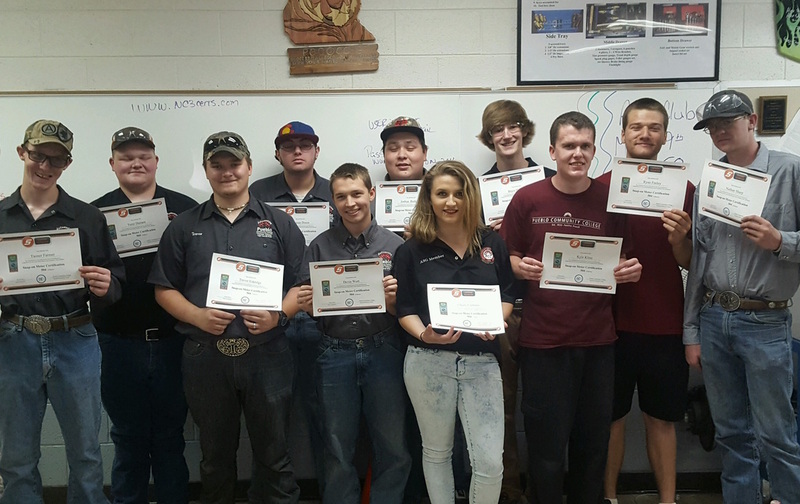 Speaking of our partnership with PCC, I would like to take a moment to congratulate the 16 Cañon City High School students who participate in our PCC-CCSD partnership vocational automotive program who completed the Snap-On Tools 504 multi-meter certification training. Tanner Farmer, Trent Durnen, Trevor Eskridge, Thomas Dixon, Devin Wort, Josh Burks Jr., Cheale Clemans, Bryce Bullard, Kyle Kline, Ryan Feeley, Nathan Sharp, Scott Ready, Robby Steinbeck, Laroy Dorn, Joe Gallagher and Dakota Wilks each earned a Snap-On certificate and a certification patch for their efforts. In addition to this, last week a number of CCMS students visited the vocational automotive class where they learned that upon completion of the three year course study they could graduate with 37 no cost college credits, valued at over $10,000. Students met with instructor John Dustin who told them what they need to do in school to prepare for his program. Mr. Dustin simply does a fantastic job in support of all our students. I would like to take a moment to congratulate Alexis Buckhaults and Aaron McCoy on their state championship hurdle runs this past weekend at the Colorado State Track and Field Championship Meet. 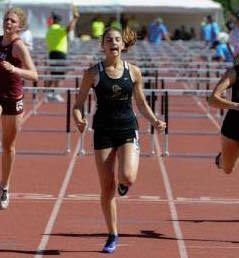 Alexis, a CCHS 11th grader, took first in the 100 meter event. Meanwhile Aaron, also a Junior, emerged victorious in the 300 meter race. Both Alexis and Aaron are prime examples of how hard work can pay off! Last, a shout out of thanks to Hunter Dean-Moore form our technology department for being kind enough to work in the administration complex on Saturday to get our computer network back up and running for the benefit of folks from our finance department who were also working outside regular hours in order to begin transitioning our finance software to a new fiscal year. Thank you Hunter for making this extra effort, and to Buddy Lambrecht and Keri Peterson for also going above and beyond the call of duty by doing this work on a Saturday morning. Our focus around the district recently has been on closing down this school year and getting ready for 2016-17. At the building level our principals have been filling their staffing positions and at the district level we have been working on negotiations compensation, hiring a new director of special services, and securing a district literacy coordinator to support our early literacy initiative. In relation to this, many of our K-5 Title, special education, and regular education staff members participated in training in assessments they will use to determine which children will be eligible to receive services at our summer school reading academy. Meanwhile, leaders at Cañon City High School have continued work on their 2020 visioning process in support of a new mission, and our district-wide special education staff has been training on how to prepare more effective Individual Education Plans. Cañon City Education Association and Cañon City School District continued negotiating updated master agreement language last Wednesday. This week negotiations concluded with the completion of general master agreement clean-up, a negotiated solution related to the effect of 6 years of salary step freezes on staff members, agreement on an updated salary and compensation package for the 2016-17 contract year, a language update regarding how the district collaboratively chooses insurance coverage for employees on an annual basis, and consensus on how the district might improve overall consistency in outcomes and expectations for students. Detailed information about tentative agreements will be available to CCEA members by May 25th to inform them about agreements made before voting on ratification. Thankfully, staff members from Harrison K-8 and CCHS provided this week’s meal. This year’s certified negotiations team included Lloyd Harwood, Kirsten Javernick, Shannon Daly, Ryan “The Manipulator” Brown, Jamie Davis, Dominic Carochi, Sheryl Wiseman, Drenda Manning, Misty Manchester, Jessica Bray, Larry Oddo, Kelly Albrecht, Diane Rivera, Tammy DeWolfe, Mark Heinen, and George Welsh. Our facilitator was Melissa Longill from the Pikes Peak Education Association. On Thursday May 19th the Cañon City Schools Classified Education Association and the Cañon City School District conducted a salary and benefits negotiation session. At the session a tentative agreement was made to create a new classified salary schedule that establishes a more attractive base and advances current employees upward in pay. Additionally, a percentage increase was added to each new pay level and contract language was revised explaining how this change affects other areas such as how much experience credit can be awarded upon hire. Finally, changes were made about which salary schedule certified mechanics will be paid from. This year’s negotiating team included Joe Fackrell, George Welsh, Cloyce Mann, Cindy Kline, Misty Manchester, Geneva Williams, and Jeff Peterson. San Luis Valley CEA Uniserv Director Dennis Carlson was kind enough to travel to Cañon City to facilitate this work. On Monday we conducted interviews for a new director of special services. We then tendered an offer to Lynette Steinhof, who has extensive background in education and administration and has most recently worked for the Colorado Department of Education in the 21st Century Community Learning Center’s grant department. On late Monday afternoon I attended the district employee retirement party and was awed by the more than 450 years of total service we honored our staff members for. On Tuesday many of our district employees were trained by our partners at Lindamood-Bell in a number of reading assessments. I checked in on that several times and also met with newly hired CCHS principal Bill Summers. I ended the day on Tuesday in a Cañon 20-20 task force meeting. On Wednesday we interviewed and selected a district literacy coordinator to be funded in large part by our Early Literacy grant, as well as through Title II funds. I am pleased to announce our selection for this position is Gina Gallegos, an extremely qualified education leader who most recently worked in the Pueblo City School District. On Wednesday afternoon and evening we held a marathon certified negotiations session where great work was done which wrapped up negotiations for this year. On Thursday I spent half the day in classified salary negotiations where I believe we came to a wonderful agreement on next year's compensation for our education support staff. On Friday I met with board director Shad Johnson, observed a Lockdown drill at Harrison K-8 School, met with a number of parents, and very much enjoyed a surprise lunch at Cañon City Middle School. Because I ran out of days this week I spent Saturday morning completing required revisions to our EARRS grant and submitting them to CDE. On Monday I'll work with instructional consultant Ted Knight returning to the district to do follow up building evaluations at CCMS and Harrison. We have a board work session beginning at 3 PM, and afterward many of our board directors will head to Pueblo Community College to honor our Gateway to College graduates by distributing their diplomas. On Tuesday I'll be in Denver to attend the BEST board meeting and to answer questions that may arise regarding our 1 million dollar grant submission for roofing repairs. On Wednesday I have another future of education in Colorado visioning session, as well as our Cañon Online graduation ceremony in the evening. Thursday I will be gone during the day to attend a retirement party in honor of a friend in Center, but will return to Cañon in time for the classified association end of year picnic, as well as senior honors night. Friday of next week is pretty open so far!